MTA for FieldPro – Heartland Technologies, Inc. 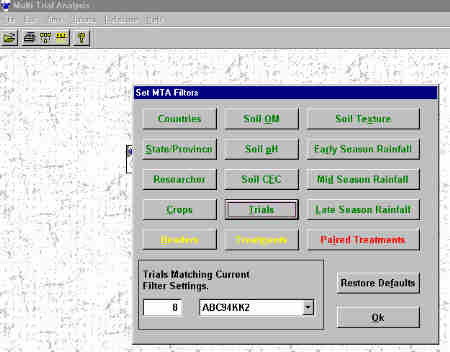 The FieldPro MTA (Multi-Trial Analysis) is a software program which summarizes multiple FieldPro trials. Trials may be selected from one or more FieldPro databases and imported into an MTA database. Once trials have been imported into MTA they can easily be edited and analyzed. The powerful editing features of the MTA make it possible to change the appearance of data (i.e. change header specie codes to user defined names) so that custom summaries can be produced. Reports can then be output to the screen, printer, or downloaded to an ASCII file or Excel spreadsheet so that the data can be used for wider audiences and uses beyond protocol technical summaries. Import data from any FieldPro trial or MTA database. Create summaries of field trials over multiple locations and/or years. Perform summaries of trials containing only selected paired treatments. Edit data from various sources and geographic locals to create a single homogeneous database. Create and manage multiple MTA data folders so that information can easily be joined and stored in many combinations of trials. Filter data to make comparisons based on combinations of key trial factors such as specie, rainfall, Soil pH, CEC, % Soil Organic Matter, etc. Edit and combine headers, chemicals, rates, rate units, timings and full treatments. Merge multiple trial headers and treatments into a single combined treatment listing. Output summary information to printer, screen, file or Excel spreadsheet format. MTA uses a complete Windows interface. After you log onto MTA a Windows menu bar is displayed at the top of the screen. This is the Main Menu, and options are selected in the same way as other Windows programs like Word and Excel: by clicking on them with the left mouse button, pressing the ENTER key on the menu option, or by pressing the underlined hot-key for the menu option. You may use the TAB/SHIFT-TAB keys to move through the menu choices. Many of the menu choices lead to Windows dialog boxes. For example, to select which crops to include in a summary, the MTA Mover Dialog opens. You select crops by moving them from one side of the dialog to the other. When you click the OK button, the operation is carried out and you are returned to the Main Menu. As with all Windows programs, the MTA window may be maximized, minimized, and resized. The main window and smaller windows like dialogs may be moved around the screen by dragging the blue title bar. Other programs may be running at the same time as MTA if your system has enough memory to accommodate them. Set filters by clicking the appropriate button and selecting items with the dialog windows which open. All of the categories use the standard MTA mover dialog to select items, with the exception of the < Treatments > and < Paired Treatments > options. The filter buttons turn colors depending on what is selected. A Green button indicates that all available items for that category are selected. Yellow indicates that some items are selected, and Red indicates that no items are selected. Items which may be filtered are Trials, Researcher, Headers, Treatments, Crops, Countries, State/Province, Soil OM, Soil pH, Soil CEC, Soil Texture, Early Season Rainfall, Mid Season Rainfall, Late Season Rainfall, and Paired Treatments. The Trials Matching Current Filter Settings box at the lower left-hand corner of the Set MTA Filters dialog displays the list of trials which match all of the current filter settings. This is the best indicator of how much data will be included in reports. If filters are set for several parameters such as treatments, headers, soil OM, etc. there may be few trials which match all of the filter settings. If the Trials Matching Current Filter Settings number is low or zero, you will probably want to expand filtering to broaden summary before you output summary report. MTA will run on any computer that is currently running Windows 7/8/10 and FieldPro. Since MTA uses the FoxPro system that is already installed for FieldPro, it takes very little hard disk space to install the MTA system. Currently, MTA takes about two megabytes of hard disk space. The size of the databases you create are totally dependent on the number and size of trials imported into them. We recommend keeping databases as small as possible in order to do a particular summary. Databases can be as large or small as you wish. Our test has included databases with up to 5,500 individual trials. Call for a price quote based on number of users.